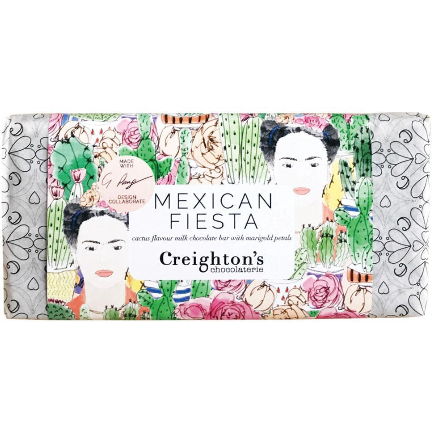 The Mexican Fiesta chocolate bar is a milk chocolate bar with exciting flavours of cactus, cayenne & marigold inspired by Frida Kahlo. Milk chocolate sets the sweet backdrop to a zingy warming finish, strewn with edible yellow marigold petals. What does a cactus taste like you might ask? Imagine green bananas with a hint of citrus and you’re not far off! Allergen info: contains soya & dairy. May contain nut & peanut traces. Vegetarian. 100g. We have more great bars in stock from Creighton’s. Take a look at the Pumpkin Spice Latte bar here! Every aspect of our products are designed in-house, from concept to creation, and produced by hand in small batches from our kitchen.